Vada's Blog Stamp Inks and Paper : Gingersnaps Black and Gray Plus Poe. 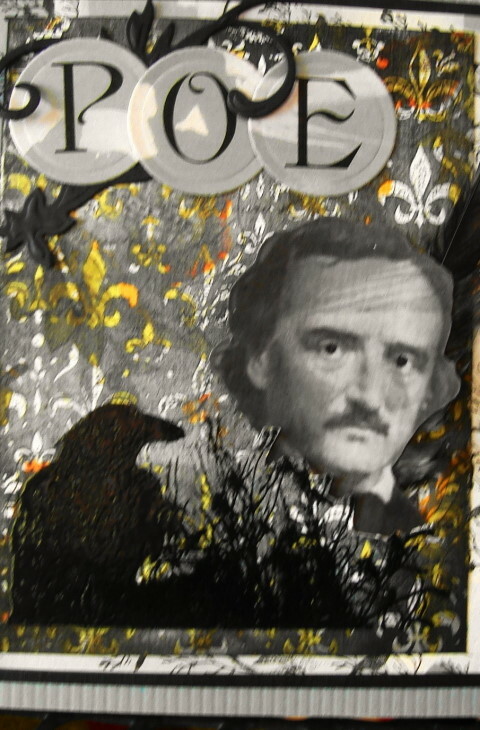 Gingersnaps Black and Gray Plus Poe. GC #124 Color Challenge is Black and Gray. It’s a “Cool Gray Day”’ here so it’s perfect for this challenge. I’m sorry ladies I didn’t have a lot of “Gray’s” in my stash of cardstock. So I ended up bleaching and dieing cardstock to get my grays. 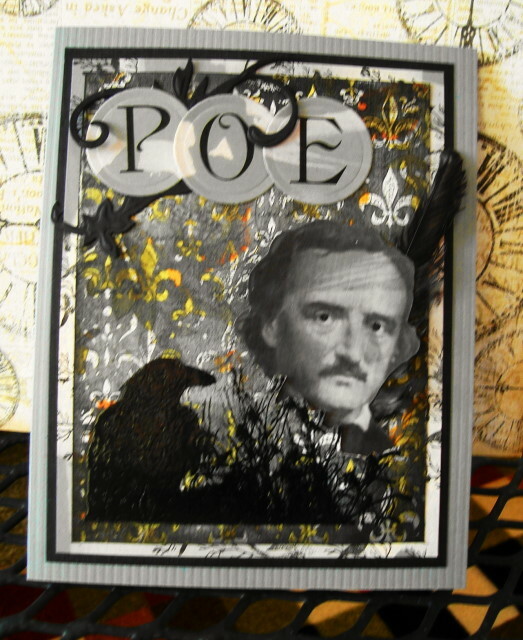 Edger was printed on “Bleached” CS then cut out, and the Printed BG paper was embossed and painted over then washed to get the gray color. I used an iron to remove the embossing then stamped the Raven and embossed the image. Needless to say this was a big challenge for me. I hope I haven’t spooked you from trying this challenge. Please stop in and take a look at all the great art work posted for this challenge. Thanks so much for your visit today, have a wonderful week- end. I like this one a LOT, Vada--yep, it's perfect for the color challenge!!! Love your details Vada! Awesome techniques for a fabulous look! Perfect! Whoa! That's fierce! I hope you win the challenge after all the love you put in to this piece of artwork! Love it Ms. V! WOW Vada, What a process but with Fabulous results!!! no takes more than that to spook me, of course not having enough hours in the day to do the challenges I want to is pretty scary! Great creation! 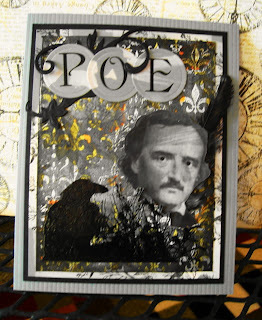 Love the Poe image. That's a great piece! Love all that texture/color shining through behind him. The atmosphere you created is astonishing. The colours may be subtle but the impact is huge. 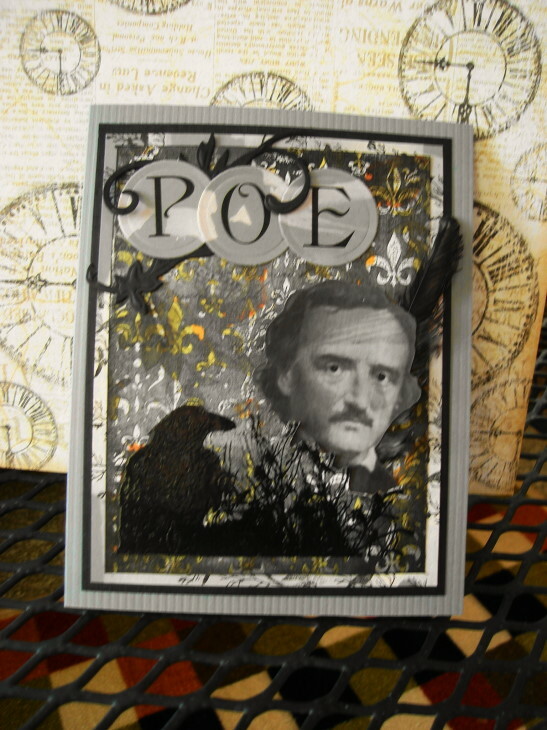 A perfect black & grey creation, so atmospheric. I am already missing Halloween! Look how awesome this is and you even made your own gray! Very cool and I love this! GC121: Chestnut Challenge - Horror Stories . A Special Thank You To Lynn Stevens.